Monarch Air Group provides private air charter in El Paso, TX. Our clients benefit from top-notch service, unrelenting dedication to safety, wide selection of aircraft, and years of experience in chartering private jets. To obtain a free quote, please use our online quoting tool provided below, or call toll free 1-877-281-3051. Monarch Air Group offers private jet charter services to and from El Paso, TX, USA. Located along the Rio Grande Valley and the Franklin Mountains, El Paso is a city in Texas and the county seat of El Paso County in the U.S. state of Texas. El Paso is located on the United States-Mexican border and has its sister city to the south Ciudad Juarez (Chihuahua). El Paso and Ciudad Juarez are situated within walking distance from each other and comprise the largest metropolitan and bi-national area on the border between the United States and Mexico. 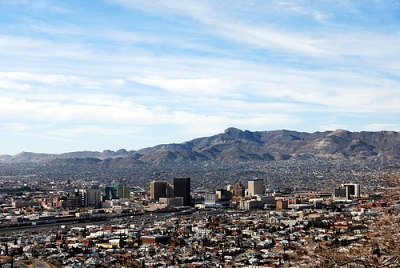 Often called “Sun City”, El Paso is a fast-growing city rich in history, culture and extensive diversity. The most popular tourist attractions are the El Paso Museum of Art, Western Playland Theme Park, El Paso Opera, Chamizal National Memorial, the War Eagles Air Museum, and the Hueco Tanks State Historic Area. Visit the El Paso Mission Trail, the oldest active missions in the US, enjoy award winning golf courses, famous sporting events, horse races, or take a short drive from Lush National Forest to world class rock climbing, pristine white sand dunes. 1. BIF, Biggs Aaf, El Paso, United States. 2. CJS, Intl Abraham Gonzalez, Ciudad Juarez, Mexico. 3. CUS, Municipal, Columbus, United States. 4. ELP, El Paso International Airport, El Paso, United States. 5. LRU, Municipal, Las Cruces, NM, United States. 6. WSD, Condron AAF, White Sands, United States. 1. Camino Real Hotel, 101 South El Paso Street, El Paso. 2. Holiday Inn Express, 409 East Missouri Avenue, El Paso. 3. DoubleTree by Hilton Hotel El Paso Downtown/City Center, 600 N. El Paso Street, El Paso. 4. Hilton Garden Inn El Paso, Tx, 111 West University Avenue, El Paso. 5. Camino Real Hotel, 101 South El Paso Street, El Paso. 6. Holiday Inn Express, 409 East Missouri Avenue, El Paso. 7. DoubleTree by Hilton Hotel El Paso Downtown/City Center, 600 N. El Paso Street, El Paso. 8. Hilton Garden Inn El Paso, Tx, 111 West University Avenue, El Paso. 9. Camino Real Hotel, 101 South El Paso Street, El Paso. 10. Camino Real Hotel, 101 South El Paso Street, El Paso.